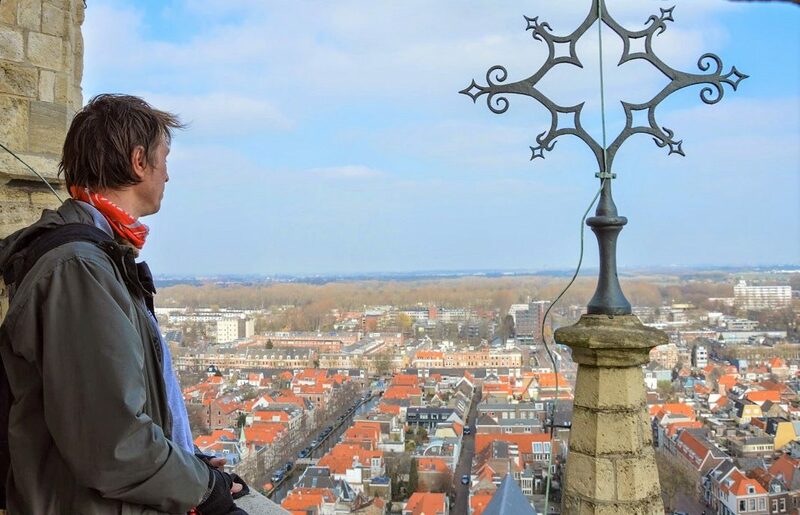 The challenge: reach the best vantage point in Delft and enjoy a view of the city and its surroundings. 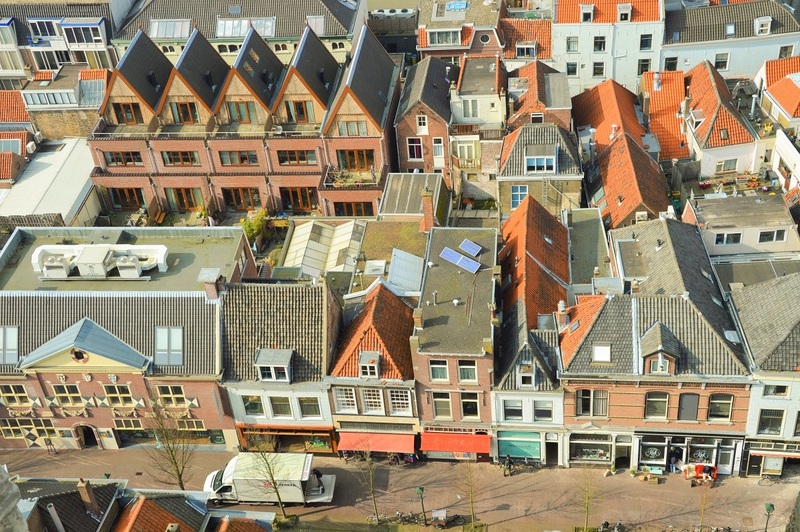 If you are searching for spots with a beautiful view over Delft in the Netherlands, search no more. Head to the central square and climb the spiral staircase of the tower of the New Church. 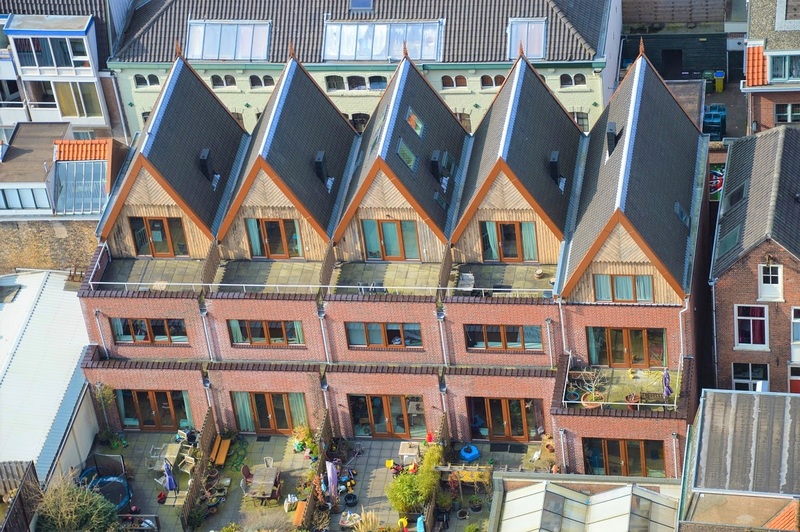 It is the second highest tower in the Netherlands and the view from above will make you feel like you are some kind of god looking over his possessions. On a clear day, you can see Rotterdam and the Hague from the top of the 85-m (280-ft) tower. 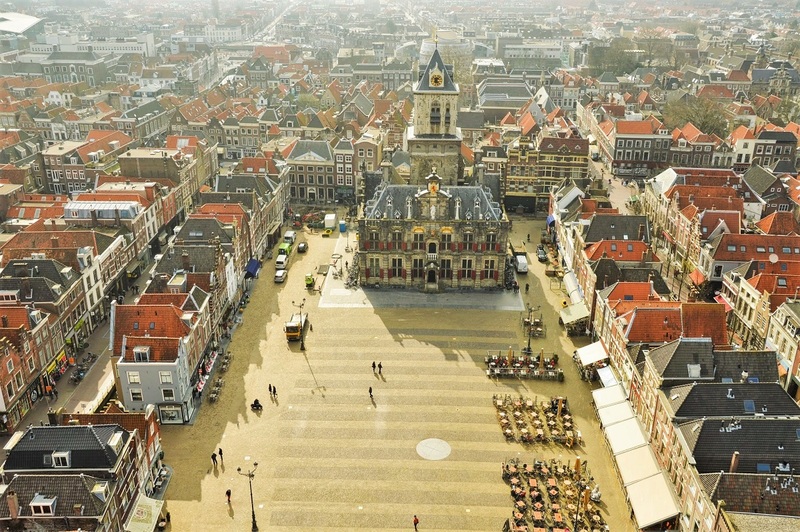 The central square of Delft has two churches facing each other – the New Church (Nieuwe Kerk) and the Old Church (Oude Kerk). The New Church is not that new at all – it was built more than 600 years ago after Symon, the beggar, and Jan Col, a citizen offering him something to eat, suddenly had a vision of a golden church dedicated to Mary. It took Jan Col 30 years to convince the city council to built the church because at the time Delft already had a church, the Old Church. But he did and the citizens of Delft believed it would last forever. They even put a golden apple on top of the tower to symbolize eternity. Little did they know that the tower would be burnt down twice and it would even be struck by lightning. If you are a bird’s-eye view fanatic like me, you know beautiful views often require (a lot of) effort. Take a bottle of water, stretch a bit and climb the 376 stairs leading to the top of the tower. 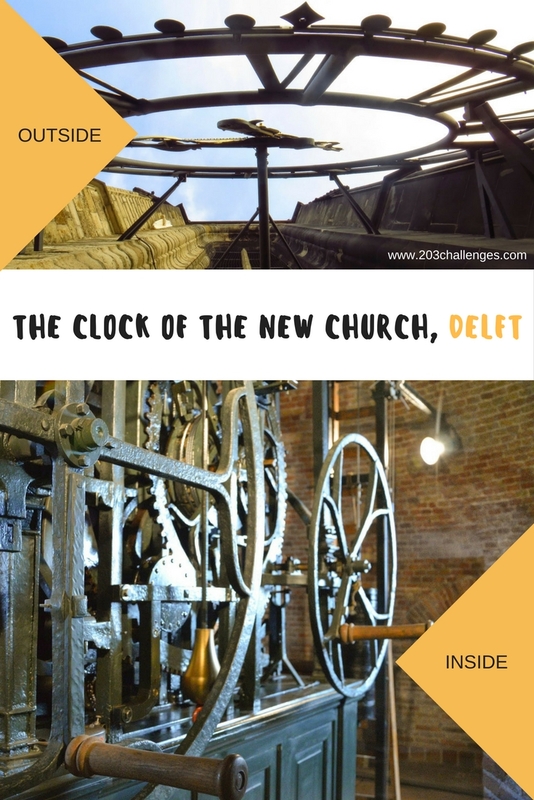 You will be granted not only a view of the rooftops of Delft, but also a look from inside at the clock mechanism of the tower. Well, actually you can’t learn that much. For more than 400 years almost every member of the royal family of the Netherlands has been buried in the crypt of the New Church (that makes a total of 46 bodies according to the church’s official website). The crypt is not open to the public out of respect to the royal family and the keys are kept by the mayor of Delft. You can hear the carillon on Fridays (from 7 pm to 8 pm), on Tuesdays and Saturdays (from 11 am to 12 pm) and if you are lucky, you might come across a summer night concert. Children under 5 years old are not allowed inside the tower, while those under 17 are welcome if they are accompanied by an adult. You can buy a ticket for the church (5 euro), for the tower (4 euro) or a combined ticket for both (8 euro). You can see the opening hours here and keep in mind that the tower closes an hour earlier than the church. 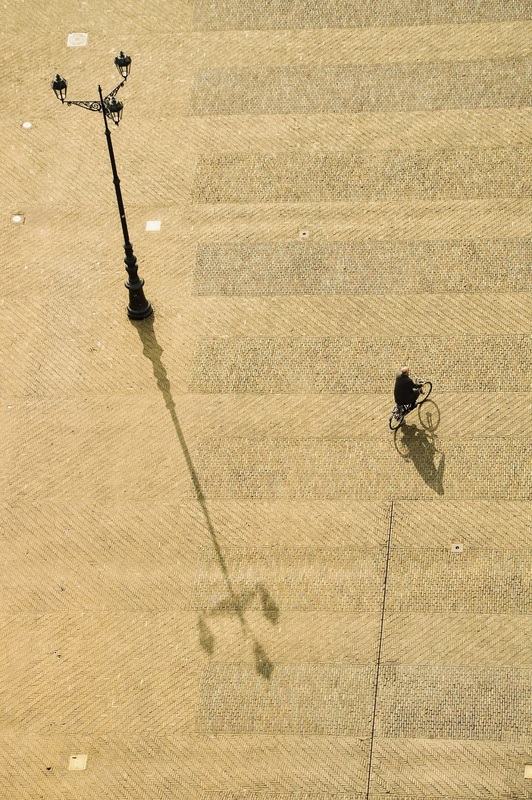 Delft seems definitely awesome and picturesque, Maria! I’ll definitely explore it more next time I go to the Netherlands. Is one day enough to see all the highlights there?